Post-Katrina New Orleans A Story Of Modern Pioneering It's been eight years since the hurricane devastated the city's Lower 9th Ward. Resident Ronald Lewis says rebuilding is a story still in progress. In a shed in his backyard, he's collected New Orleans memorabilia, evidence "of the resilience of the people." Ronald Lewis, a resident of the Lower 9th Ward, says eight years after Hurricane Katrina, rebuilding his neighborhood is a story still in progress. It's been eight years to the day since Hurricane Katrina devastated the Gulf Coast. To mark the anniversary, NPR revisits neighborhood activist and curator Ronald Lewis, a New Orleans resident whom Morning Edition host Steve Inskeep regularly checked in with in the months after the storm. "Unbelievable." That's how then-displaced Lower 9th Ward resident Ronald Lewis described his neighborhood in the days after Hurricane Katrina. "A part of your community just completely washed away," Lewis told Morning Edition host Inskeep. At the time, one of his neighbors' homes was perched in the middle of the street. Since then, recovery has been as bumpy as the potholes in the street. For every block populated with new, elevated homes, there are other blocks overgrown with shoulder-high weeds and the boarded-up remains of once-flooded houses. Lewis' block on Tupelo Street is now back. In a tin-roofed shed in the backyard, Lewis has recreated a place he calls the House of Dance and Feathers, a magical room stuffed with memorabilia. A visitor looks around the House of Dance and Feathers, Lewis' museum of memorabilia tucked in a shed in his backyard. "This is my post-Katrina collection 'cause my pre-Katrina collection went with the 14 feet of water," Lewis says. There are photographs and regalia from the city's social aid and pleasure clubs, including elaborate beaded and feathered Mardi Gras Indian costumes that hang from the ceiling. Mardi Gras Indians are the African-American parading organizations that date back to the late 1800s and pay homage to the Native Americans who helped hide runaway slaves. "This collection shows the resilience of the people. We had lost everything, but we didn't lose hope. So every piece in here is symbolic of that — of people wanting to share in the story of us rising up out of the ruins of Katrina and saying, 'We're here, we're back,' " Lewis says. Lewis, a retired street car line repairman, is president and co-founder of the Original Big Nine Social Aid and Pleasure Club. The group parades in December and spends the rest of the year doing community service projects. In the immediate aftermath of Hurricane Katrina, those ties became the connecting fiber for the displaced neighborhood. Frustrated with the pace of progress, Lewis turned community advocate. "It was just distasteful being called a 'refugee on American soil' and 'the poor, poor people of the Lower 9th Ward.' We weren't even given credit of being the working-class people. So I took sort of offense to that," Lewis says. In the back corner of the House of Dance and Feathers, Lewis has a Katrina display. "From the type of food that they gave us and the things that became a part of our life," he says. "I didn't want those things to be forgotten." 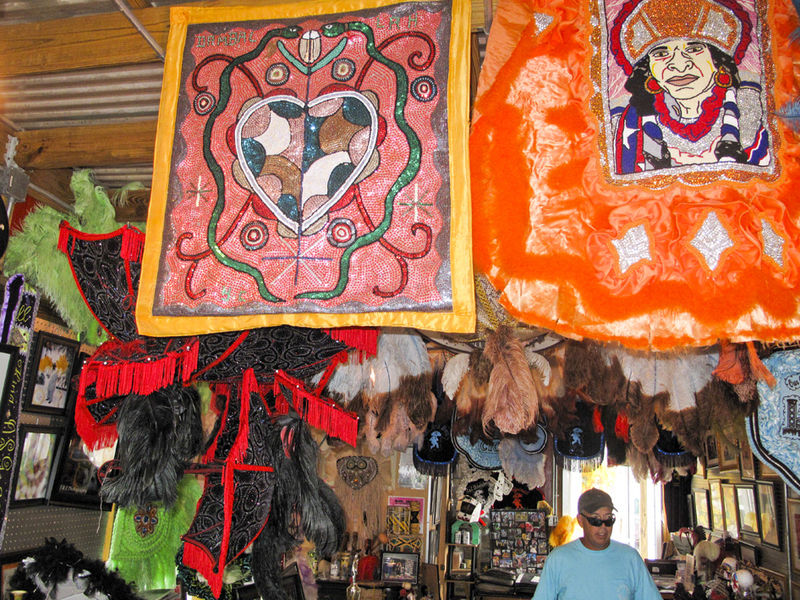 The House of Dance and Feathers features a display of supplies given to residents after Hurricane Katrina. 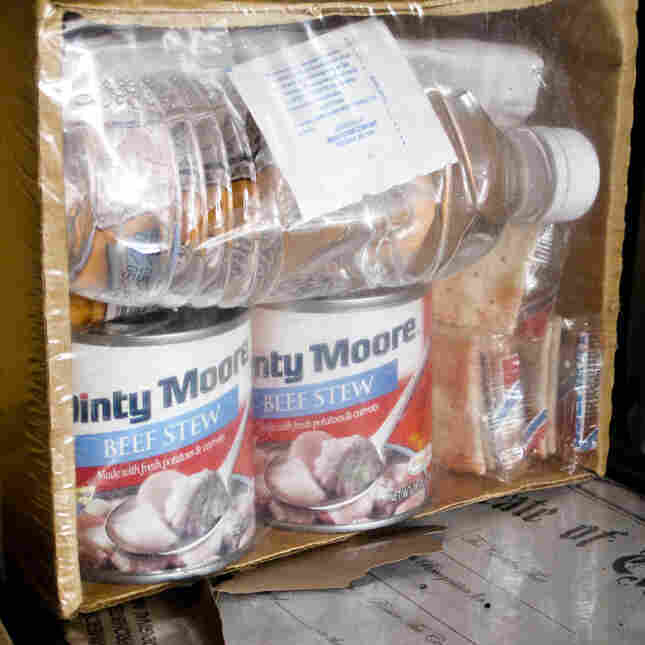 There are small crates of canned beef stew and bottled water and a red voodoo doll named Katrina with a pin through her heart. Four large scrapbooks document the story. Eight years later, Lewis says it's a story still in progress, one of rebuilding one house and one family at a time. He calls his neighbors modern pioneers. "Katrina created a vast wasteland down here in the Lower 9th. And out of that I always tell this story about how settlers used to ride across the mountains and see a single house and a smokestack," he says. "And from that single house and smokestack became a town, and from that town became a city." 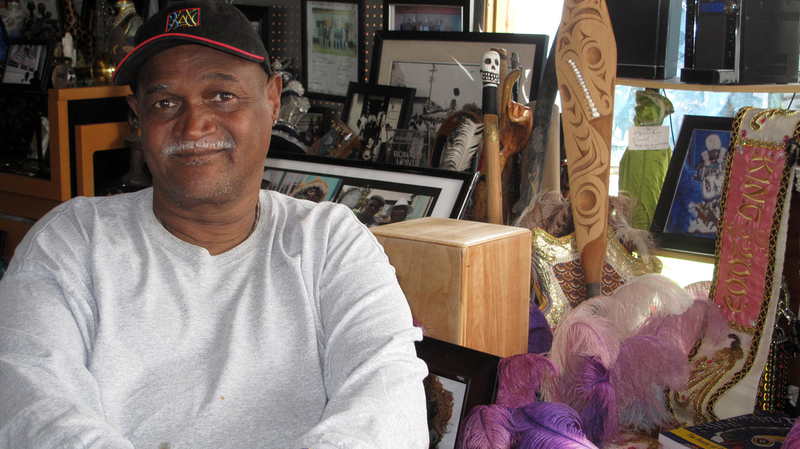 Lewis hopes the House of Dance and Feathers behind his rebuilt home can be the smokestack for New Orleans, celebrating what makes the city unique. Lewis says he's not a museum curator, just a New Orleanian and two-time hurricane survivor committed to keeping his culture alive.